If Brexit was hacked, shouldn't we know exactly who paid? Yes, the Leave campaign probably cheated. And yes, Remain played unfair advantages. But where did the Brexit dark money actually come from? And how is it still shaping our democracy? 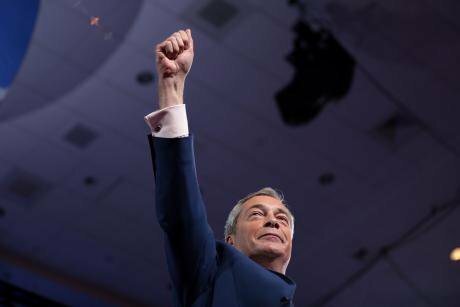 Image: Nigel Farage speaking at the US Conservative Political Action Conference in 2017, Flickr/Gage Skidmore, CC license. Hours before the Observer published fresh, damaging allegations about how the various pro-Brexit campaigns colluded, possibly illegally, in the weeks before the UK’s knife-edge EU referendum, Vote Leave Campaign Director Dominic Cummings published a long screed of pre-emptive defence on his blog. It’s thousands of words ‘what-aboutery’. What about all the ways in which the ‘Remain Establishment’ skewed the campaign in their favour at every turn? Cummings asked. The £9m worth of taxpayer-funded pro-Remain propaganda delivered to every household in Britain before campaigning officially started? How David Cameron, George Osborne and others abused their privileges of office in myriad ways to try and scare people into voting Remain...? But fast forward to 2018, and Cummings’s what-aboutery is doing something altogether different. It’s there to reinforce the most cliched folklore of Brexit – and to obscure the most important question of all: Who bankrolled the campaign that has caused one of the biggest political shocks in a generation? And how is dark money continuing to exercise power and influence not only in the UK, but across western democracies? This is patent nonsense. Both campaigns, Leave and Remain, were masterminded by elites – and the actual voting demographics dismantle the cliché that poor people in the North voted for Brexit, while rich people in the South East shunned it. As my colleague Adam Ramsay reports in his excellent analysis of the pro-Leave campaign, Veterans for Britain; “Brexit was as Establishment England as they come”. And yet this myth – of the plucky, brave underdogs who started a revolution to take their country back – is a highly convenient one. Particularly when journalists start asking awkward questions. Easier to write off Carole Cadwalladr at the Observer as a sore loser than to answer questions about AggregrateIQ, the Cambridge Analytica-linked firm that, mysteriously, no one in any Leave camp can remember much about – despite collectively shelling out millions for their services. (Here’s Adam Ramsay and Peter Geoghegan putting this awkward question to DUP’s Brexit campaign manager, Jeffrey Donaldson, in May last year. Here’s Adam and Peter tracking down the obscure branding agency they all used, headquartered in an empty semi-detached house in Ely). Easier, too, to throw around vague, anti-Semitic tropes about George Soros than to come clean about where the Brexit campaign cash came from, after openDemocracy’s reporting triggered questions in parliament about the role of dark money in the EU referendum – and the concerns about foreign and particularly Russian interference in western democracies. (Easier, also, to mock and threaten Carole on Twitter by sharing a gif of her being repeatedly punched in the face, and to issue thinly-veiled threats through lawyers, as Arron Banks and his Leave.EU outfit has done, than to answer all these tricky questions from “sore losers”). There are transparency laws in Britain which should make the answer to this question straightforward. And yet it’s not. openDemocracy has been investigating a set of key questions over the past year. Our reporting on the DUP’s secret Brexit donation; on the finances of the Leave campaign’s biggest backer Arron Banks; and on the many groups seeking to shape Brexit have prompted questions in parliament. They’ve triggered a law change ending donor secrecy in Northern Ireland. And they have contributed to three separate ongoing investigations by the UK Electoral Commission and one by the Charity Commission. But thanks to a breathtaking government stitch up, we still don’t know who gave Theresa May’s allies, the DUP, half a million pounds for lavish Brexit campaigning in the final weeks before the vote. We also still don’t know how Arron Banks found £9m in cash to bankroll Brexit (making him, implausibly, the largest political donor in Britain’s history). And we still don’t know who funds many of the powerful groups seeking to shape Brexit (apart from us, the taxpayers, through an outrageous yet perfectly legal loophole). We care about this not because we are “hellbent” on reversing the referendum result, but because it’s essential that citizens in every country know who bankrolls their politics – and who is shaping what they read, see and hear. Before we get accused of being sore losers, as Carole and other journalists doing their jobs have been, here are some facts. During the EU referendum campaign openDemocracy’s UK editor Oliver Huitson spelled out his reasons for voting Leave and gave space to many others from pro-Brexit voices, including Matthew Elliott, the Chief Executive of Vote Leave. One of our best known, frequent UK-based contributors is the conservative commentator Peter Oborne, a vocal supporter of Brexit. Our largely UK-based board of directors includes prominent Brexit supporters. Since the referendum, openDemocracy has hosted the full spectrum of voices on Brexit, from leading Brexiteer Michael Gove, to hip-hop artist Akala on the roots of the Brexit impulse. openDemocracy’s founder, Anthony Barnett, has written an excellent book on Brexit and Trump which (although pro-Europe) sympathetically charts the reasons for voting Leave, and is searingly critical of the Remain-supporting establishment. Adam Ramsay, our current UK editor, recently spelled it out: Remainers: don’t use our investigations as an excuse. We actively seek our perspectives which challenge assumptions and bust filter bubbles (see, for example, our some of our first responses to the seismic events of 2016: Why I voted for Donald Trump or Stop sneering at Leave voters, they knew exactly what they were doing). All the way along, we’ve brought European voices into what’s often a depressingly limited, parochial national conversation. We are proud to be an independent, global platform hosting a wide range of voices; perspectives from almost every country on Earth on vital issues, from all sides (because there are never just two sides). We are also proud to be part of a very small, under-resourced network of journalists working on a story which has raised a string of vital questions for modern democracy: who gets to shape our elections, and who has access to key information about our lives.